A huge thank you to those parents that came to our Musical meeting yesterday afternoon and for volunteering their time. We are very grateful to those that have put their names down. If you are still able to help and were unable to make the meeting please let me know! It was with great pride that we watched Grace, James, Ella and Curren march in this year's ANZAC Day parade to represent Our Lady of the Cape. It was a vey moving service with a large number of people in attendance which is always wonderful to see. Our students conducted themselves beautifully and with great respect and understanding of this important day in Australian history. Mr Morrison and I were very proud of Grace, James, Ella and Curren. They were lucky enough to have a photo with a true veteran Mr Keith McKinnon! 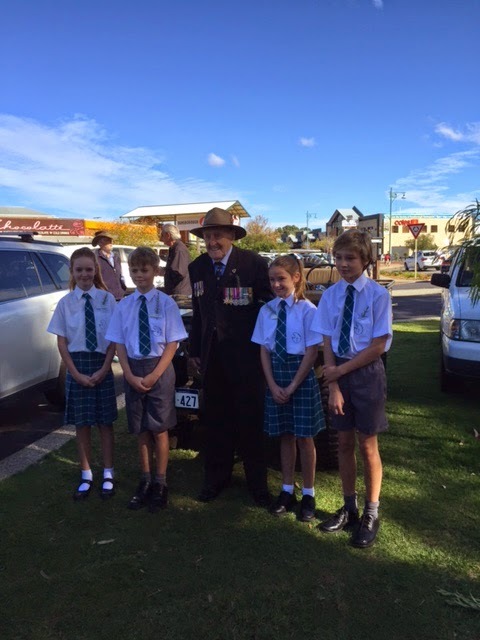 Mr Keith McKinnon and OLC students Ella, James, Grace and Curren. One last shot for the paparazzi as we get the once over! We looked very sharp!! The beautiful wreath created by Wendy Gillam - it was beautiful! Diary –the students are given time every day to write all appropriate notes in their diary. I ask that you check your child’s diary each night and sign it. I also use the diary as a way to let you know how your child is going or if I need to see you? Maths – IXL– each day the students will be assigned an IXL Maths task to complete at home that night. These tasks are aligned to our learning in class and provide a way to practise and consolidate the skills from our classwork. Tuesday K.2 - Identify FactorsWednesday G.5 - Estimate sums and differences: word problemsThursday A.2 - Word names for numbers This is done to a maximum of 15 minutes. This year for the Year 6 Graduating class it has been decided that for our Leavers Shirts this year we will use our existing OLC Polo Shirt. We will design a piece of art for the shirt which will appear with our school crest on the front and “Graduates 2015” along with our chosen artwork and student names on the back. You have two options in regards to the shirt: 1.You can provide a clean and tidy polo shirt that your child may already have. 2.You can purchase a new polo shirt from the uniform shop. The total cost for the work to be done on the shirts is $7.90 each. This can be paid directly to myself or through the office. This amount will need to be paid by Friday 15th May. These shirts can be worn on Tuesdays and Fridays instead of the normal sports shirts. Please find below some important information regarding Camp 2015. The adults attending Camp are Mrs Caitlin Delane. Mr Sean McSevich, Mrs Bernie Morrison, Mr Dan Meyer and Mr Andrew Stocks. I am very grateful to those parents that volunteered their time, I wish that I could have taken everyone! We will spending the week at DARE Adventure Camp in Dwellingup. This is located on Vandal Road, Dwellingup. The contact number in an emergency is (08) 9538 1314. In the unfortunate event of a family emergency please contact Mr Alan Morrison directly and he will get in touch with me. The activities are designed to challenge the students physically and mentally, encourage and facilitate teamwork and strengthen bonds with each other. Some of the activities include Abseiling, Archery, Bush Walking, Flying Fox (so much fun), Mountain Biking, Orienteering, Raft Building, Bush Craft and the legendary Night Walk. Welcome Back to Term Two! Tuesday 21st April - Friday 24th April. Reading –I ask that the students read for a maximum of 15 minutes each night. If possible, can you ask your child to read out loud to you regularly? It is a great way to show your interest in their learning and it is beneficial for your child to hear themselves. It also helps them to correct any mistakes, as well as giving them practise for our Assemblies etc. Please make sure that your child writes the name of the book they are reading and the number of pages read in their diary in the appropriate space.